Sixty-three years ago, Bob Baker was a young Army corporal stationed at Outpost Harry during the Korean War when he embarked on what his commanders warned would be a suicide mission. When he ended up in the middle of a minefield during the night patrol for Chinese soldiers, he was glad that he made a deal with God. If he was able to come back alive, he would he would do whatever he was able to do. “I told Him, if He spared me that night, I would go home, get married, have six children, become a success and do whatever he wanted me to do,” Baker said. Bob Baker believes that God had a special plan for him, a plan that has guided him on his journey to helping others. Blessed with a beautiful family and the success of his business, the Bob Baker Auto Group, he has given back by generously supporting the Catholic Church, his community, plus programs for military veterans and the homeless. Bob’s personal connection to CNEWA comes from his Christian Lebanese and Irish Catholic heritage. His paternal grandparents came from Lebanon and belonged to the Greek Orthodox Church. He struggled as a child, and at one point was destitute. So he is especially moved by CNEWA’s childcare initiatives, which assist needy children and orphans. For his spirit of optimism, generosity and selfless giving — a genuinely Christian spirit that has changed countless lives, including many in CNEWA’s world — Bob Baker is truly a CNEWA hero. 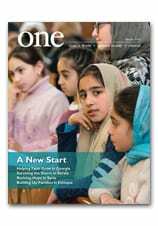 In the Summer 2016 edition of ONE, Gayane Abrahamyan writes about fatherless families in Armenia. Here, she reflects on a visit to one family in particular. Even 28 years after the earthquake, more than 4,000 people are still residing in what was intended to be temporary shelters — tin structures referred to as “domiks,” provided as part of the humanitarian aid; several generations have been born in them, lived, grown old. Meanwhile so much has changed in the city itself: beautiful new squares have been built, statues and monuments erected on almost every corner. But, sadly, nothing has changed in the domik districts, and only the presence of cell phones points to the fact that it is, actually, the 21st century. Two years ago, when I was working on my piece about seniors living alone with no families, Shaken by the Earthquake of Life, it was beyond agitating to enter each home, listen to each story. Tears of frustration and fury, born from the sense of helplessness, were choking me — fury that two decades later, they still lived in extreme poverty in the domiks that were the earthquake legacy, while an Armenian official’s most basic housing costs a few million US dollars. Injustice is so striking in this city in particular, where holes in the walls and the floors of these tin structures — by now in complete decay — are patched by tin cans in a futile attempt to protect residents from rat attacks. The bitter sense of injustice and unshed tears kept choking me until I could no longer resist when I stepped into another house of poverty, famine and destitution, where 32-year-old Arpineh Ghazaryan resided with her two boys, their eyes mirroring a lost childhood and hunger and yearnings, yet full of so much warmth and love. It was hard to write about seniors and their issues; it is, perhaps, an even harder task to write about children and their pain. This time, my search was for children who lost their fathers due to unemployment. The fathers went abroad as migrant workers, leaving their families behind — wives hoping one day their husbands would return home, children waiting for fathers, waiting for so long they no longer remember the faces they are waiting for. Arpineh is raising her two boys as a single mother. Providing food is the biggest challenge, along with the fight against rats. During winter, when the temperature can drop to -22F, there is the additional challenge of trying to heat the 28-year-old rusty tin structure with cracks in walls. “Sometimes, I just want to no longer be alive and free myself of these problems, and when they start asking questions, I feel completely lost,” says the beautiful young mother, too skinny and exhausted from hardship and lack of nutrition. Questions were asked by the two fair-haired boys with eyes as deep as the sea, for whom the happy thoughts of toys and cartoon characters had long been replaced by concerns that are impossible to solve. They have the desperate desire to help their mother; they also have dreams of being equal to their classmates at school, dreams that just can’t come true. Nine-year-old Artyom walked me out and gave me a warm hug by the door, concealing his tears behind my shoulder. He was silent for a moment — then, suddenly words burst out of him. “I am so happy you came,” he said. “At least my mom was able to vent and feel a little better. If we had a house, perhaps, my mom would be smiling,” he added and gave me another hug, so that I would not see his tears. Meanwhile, my own tears were burning my eyes. Every time I visit Gyumri, I feel broken. Solving its enormous issues seems an impossible task, and that’s the worst feeling. It makes me want to give up reporting, forget about being civilized, take all the seniors and children, all the mothers forced to put starving children to bed, take them all and break into the luxurious offices and houses of our officials and make them face these people, look them in the eyes, and confront the heavy challenges of the country under their rule. Read more about Armenia’s Children, Left Behind in the Summer 2016 edition of ONE. And visit this link to learn how you can help the suffering people of Eastern Europe. In this image from 2003, an Eritrean Orthodox bishop displays two Coptic-style crosses. The hand cross is used for blessings. To discover more about the Orthodox Church in Eritrea, read Ancient Church in a Young Nation from the November-December 2003 edition of the magazine. Pallbearers carry the coffin of the Rev. Jacques Hamel on 2 August outside the cathedral in Rouen, France. Father Hamel was killed 26 July in an attack on a church at Saint-Etienne-du-Rouvray near Rouen; the attack was carried out by assailants linked to the Islamic State. As a Catholic missionary, the Rev. Jose Manjiyil, C.S.T. spent 30 years of his priestly life in the mission territory of Gorakhpur-Nepal Province of Little Flower Congregation (known as the C.S.T. Fathers). Ordained a priest in 1986, Father Jose is also a lawyer and educator; he holds a Ph.D. in civil law, along with degrees in Arts and Education. Through the years, he has been a good companion of CNEWA. His relationship with CNEWA began in 1997, when we provided financial assistance for constructing Mount Carmel Church in Gorakhpur. In the years that followed, St. Mary’s Primary School was upgraded to a Hindi medium school for the poor children of the villages recognized by the Uttar Pradesh Government, thanks to Father Jose’s hard work and the generosity of American donors through CNEWA. But healing the sick in Gorakhpur was Father Jose’s main concern. CNEWA supported his mission — and he received acclaim for his efforts. Diocesan social workers go from village to village to offer health care and teach villagers basic hygiene. They teach mothers natural methods of family planning and administer immunization programs; the task is gargantuan and, at times, frustrating. “Our goal is empowerment,” says Father Jose, “to teach people how to keep clean and treat problems at home. CNEWA continues its support in Gorakhpur today among the poor — providing faith formation, help with hygiene and sanitation, assistance with finances, and pastoral outreach programs. Today, Father Jose is the Director of Educational Institutions under the Little Flower Congregation, which runs more than 60 schools, technical schools and colleges. He has been a great asset to the Catholic Church in India — and is a true CNEWA hero. Displaced Iraqis gather 16 July at a refugee camp near Mosul, Iraq. Security tops the list of what Christians of Iraq and Syria want before they’ll consider returning to areas they fled when the Islamic State and other extremist groups took over. They also want help with displacement difficulties, justice for past offenses, self-governance, ethnic militias, and the right to ultimately choose to move permanently to Europe, the United States or beyond, said representatives of Christians and other minority ethnic groups. The minority representatives spoke at an all-day conference at Jesuit-run Georgetown University 28 June. The following day, the same group met at the U.S. State Department with representatives of more than 20 countries involved in supporting a post-Islamic State scenario in Iraq and Syria. “The important thing ... is the security and the confidence that a family, a father, a wife, a child a daughter ... can be safe in their own home,” said Bishop Awa Royel of the Assyrian Church of the East. Bishop Royel and other members of indigenous Iraqi Christian groups told Catholic News Service at the Georgetown conference that up to 70 percent of Iraq's Christians had fled their native country since U.S.-led forces toppled dictator Saddam Hussein in 2003, and that, due to the Islamic State takeover of northern Iraq in 2014, close to 150,000 Christians from those areas had either escaped to nearby Kurdish-controlled areas or to neighboring nations. “Security is important, long-term security, against ISIS and against any other group that could come up in the future,” Bishop Royel said, suggesting one way to achieve that was through international protection and a “constant line of dialogue” among northern Iraq’s various ethnic groups, to prevent the weakening of society, which the bishop said had facilitated the Islamic State takeover. “When there are suspicions and when there are mistrusts, you have each religion going into their own little corner. Leaders of various religions present in Iraq ... have to meet regularly, not to discus theology, but just to share what the communities are going through,” he said. Both “empowering (Christians) to take administrative control of their areas” and “training Christian youth to protect their areas” must be achieved for displaced Christians to feel safe enough to return home after Islamic State has been defeated, said Syriac Catholic Father Behnam Benoka of Iraq. Bishop Royel, Father Benoka and the other Christian representatives to the conference's different panels told CNS that, in addition to their concerns regarding safety of the future, they were worried about the immediate welfare of tens of thousands of Christians now living in camps, containers, and in other desperate situations, in areas where they had fled inside Iraq and Syria, or in neighboring countries. “As a minority ... you pay the biggest price,” said panelist Bassam Ishak, a member of Syria’s Christian minority who estimated that well over a million of his co-religionists had been displaced due to the violence of ongoing civil war, Islamic State, and other extremist groups back home. “We need a political resolution ... that takes into account the Syrian diversity and seeks to build a pluralistic Syria. Then (Christians) may have a future, and we may even have some ... who return,” Ishak said. Concerns of the conference’s Christian panelists’ mirrored for the most part those of the region’s various other minority groups. Conference panelist Rajab Assi Kareem, speaking on behalf of Iraq’s tiny Kakai minority, said Islamic State had destroyed the group’s places of worship and that it was up to “the United Nations to ensure the peace” needed to prevent it or similar extremist groups from ever coming to power again. Picture of the Day: "We Should Be One Together"
At least for a few minutes at World Youth Day, the physical barriers between Palestinian and Israeli communities were nonexistent. A group of Palestinian Catholics and a contingent of Hebrew-speaking Catholics from Israel found themselves in the same sector at the Field of Mercy for the closing programs of World Youth Day. The two groups talked for a short time after arriving on the open fields the afternoon of 30 July, members of both delegations said. The time together was cordial and offered a chance to meet people of the same faith living in neighboring communities who might not meet under ordinary circumstances. “We’re all Christians. We always try for peace,” said Asil Zarek, 17, of Beer Sheva, Israel. Pilgrims in both groups said they were not sure how to overcome the political barriers that exist across the two communities, but they thought their faith could be a bridge. The theme of mercy ran throughout the six days of World Youth Day. Many participants, some of whom arrived as early as 10 a.m. for the evening vigil, reflected on their experiences in Poland, the new friends they made and the messages of mercy the emanated throughout liturgies and catechetical sessions of the festivities. Seeing so many people sharing the Catholic faith impressed Andria Saenz, 20, a member of St. Patrick Parish in Laredo, Texas. She said being at World Youth Day also was about being on a pilgrimage to better understand her faith and the people of the world. It also was the first significant journey for Jacqueline Ndecky, 32, of Guinea-Bissau, and the 14 others in her group. She said seeing so many people focused on the life of Christ was gratifying. A small group from the Diocese of Arecibo, Puerto Rico, was resting while waiting for the pope to arrive. Efrain Torres, one of 38 in the contingent, had been at previous World Youth Day celebrations, but never as a leader of a group, like this year. He said he was eager to hear what Pope Francis had to say. Sister Catherine Holum, 36, an American Franciscan Sister of the Renewal ministering in the Archdiocese of Birmingham, England, was smiling as she talked with four other sisters from her order and three pilgrims from the archdiocese. Sister Catherine described the week as a joy to experience. She also had been involved as an emcee at a catechetical session earlier in the week, keeping 150 young people engaged in the conversation through prayer, song and enthusiasm. “This is where you meet the word, share the Lord, have a great encounter and make new friends. It’s a very beautiful thing,” she said.